The ultimate chewy ginger molasses cookies that are crispy and cracked on the outside with a chewy inside. For me, the holidays always include cookies. The huge platter of cookies that I put out every year for our family Christmas dinner are the first thing to be devoured. I’ll bring cookies with me to every party, gathering and get together during the holiday season. Now that November is almost here, everyone and their mom will be thinking about holiday recipes, but mostly focused on the desserts and cookies — that’s the best part of holiday eats, isn’t it? This recipe for chewy ginger molasses cookies will without a doubt become one of your new holiday favourites. I brought these with me to a Halloween party over the weekend and already have a ton of people asking me for the recipe. These ginger molasses cookies are on the larger side of the cookie spectrum, they are sweet with hints of ginger and molasses with a perfectly cracked and crunchy outer shell with a soft and chewy inside. They are rolled in coarse sugar, which almost makes them look like they are sparkling. 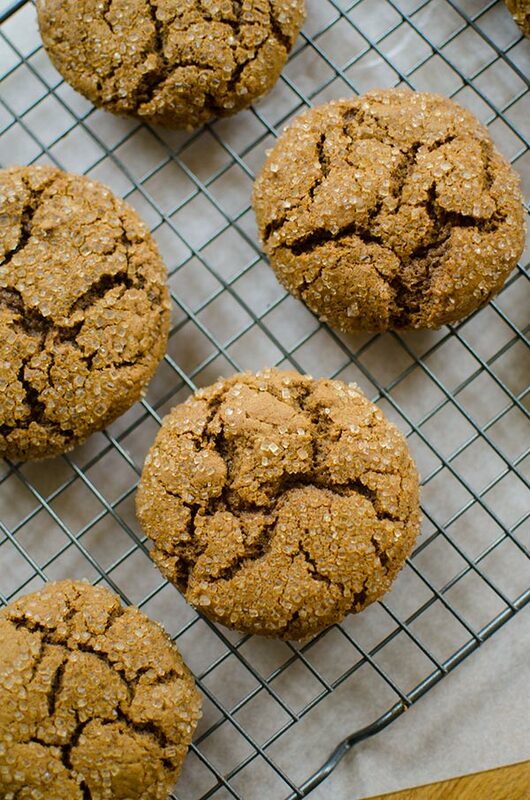 I’ve baked many ginger molasses cookies in my time, and this recipe is without a doubt the best. So what’s the secret? Egg whites. What I discovered while I was developing this recipe was that using only egg whites is what gives these cookies the perfectly cracked appearance and crunchy shell. Mystery solved! For this, I use Burnbrae Farms Naturegg Simply Egg Whites which are made from 100% pure egg whites. I hate wasting food, and I find that if I’m making something that only calls for egg whites, I’ll often end up tossing the egg yolks. Seriously, what does everyone do with extra egg yolks other than make hollandaise sauce or homemade mayonnaise or custard? This way I have a convenient carton of egg whites in the fridge (or in the freezer) along with my regular eggs so there is no waste! This is a game changer. The other reason why these cookies are so good (and similar to the ginger molasses cookies you’ll find at Starbucks), is that I’ve used half molasses and half light corn syrup. I found that using only molasses ended up with a slightly more bitter cookie that wasn’t as chewy. Splitting it half corn syrup and half molasses still gives these cookies the classic molasses flavour without it being overpowering. Are you planning on doing any holiday baking? I’d love to see your creations – share them with me and Burnbrae Farms on Twitter, Facebook and Pinterest using #CookieEggChange, and if you make my recipe be sure to tag me in it (I’m @livingLou on Instagram and @Living_lou on twitter) so I’m able to see your creation! We will also be having an #CookieEggChange Twitter party to celebrate on December 1st at 9pm EDT I hope to connect and chat with you there — plus there will be some incredible prizes! (The contest is now closed). In a large bowl, whisk flour with baking soda, ginger, cinnamon, allspice and salt. In the bowl of a stand mixer, cream butter and brown sugar together until light and fluffy, about 4 minutes. Mix in egg whites, once combined add corn syrup and molasses. Beat until fully mixed, scraping down the bowl as needed. Gently stir in flour mixture in two additions. Using a standard ice cream scoop, scoop 12 cookies and roll into balls. Roll in coarse sugar, and place 2 inches apart on a baking sheet. Bake for 12-14 minutes, allow to cool for 10 minutes on cookie sheet then fully on a wire rack. Repeat with remaining dough. 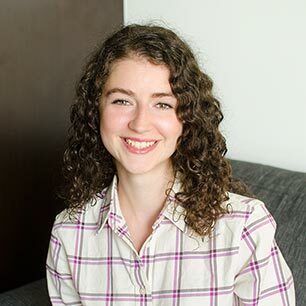 Disclosure: I am participating in the Burnbrae Farms campaign managed by SJ Consulting. I received compensation in exchange for my participation in this campaign. The opinions on this blog are my own. Thank you for supporting my sponsors and allowing me to create recipes like these chewy ginger molasses cookies. These cookies look soooo yummy! I am definitely going to make them! Love your commentary & your photography, as always! I am not 100% happy with my recipe for this type of cookie and have been looking for something new, thanks! You'll have to try these and let me know what you think, Carole! I think it's the egg whites and combo of molasses + corn syrup that do the trick! Thanks Shareba! Let me know if you give them a try. Hey Louisa! 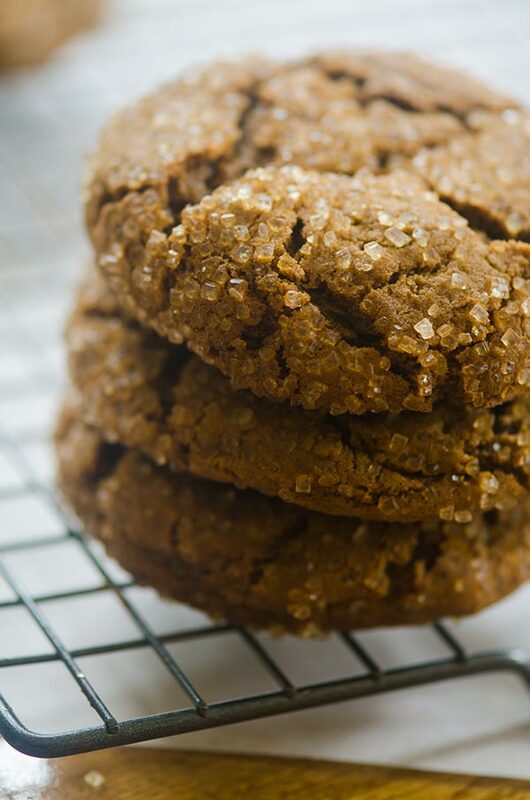 Super chewy ginger molasses cookies are some of my favourite cookies. This recipes looks amazing! If you wanted to, you could make egg yolk ravioli with those extra yokes... I've seen it done before and I want to make them, but they are intimidating! haha. Anyway, I want those cookies in my mouth right now! Thank you! These are the best! Just made these cookies and they are perfection! 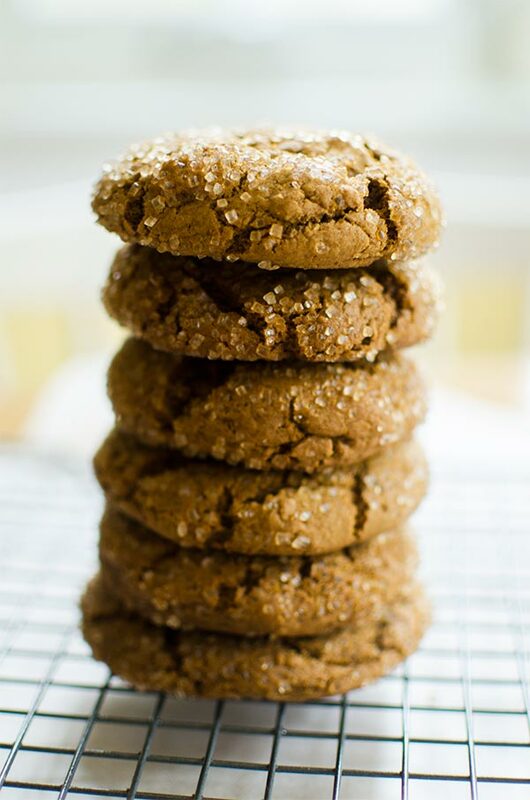 I've tried making ginger molasses cookies before but they've always come out too hard or too bitter -- these cookies were perfectly chewy with just the right amount of sweetness. Definitely bookmarking for the future; thanks for sharing!